Admit it: you despise those love handles and that extra fat in your tummy. That excess fat is not only unattractive, but according to Harvard Medical School, it increases your risk of health conditions, such as breast cancer, heart disease, hypertension and type-2 diabetes. 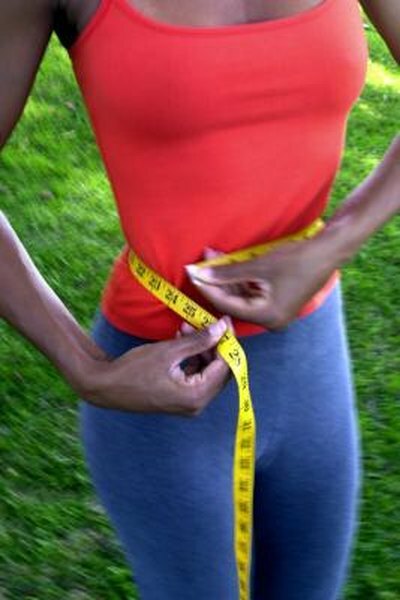 Whittling away your waist doesn't have to be an impossible task. By following a workout routine that focuses on cardio and strength training your waistline can go from flab to fab. Cardio training is crucial for fat loss, especially around the belly. As you burn calories with aerobic training, you melt fat from all over your body, including your obliques. Choose to engage in aerobic activity that uses your core. Activities like running, swimming and kickboxing all require you to keep your abdominals engaged during your workout, helping you build a leaner core. Train aerobically five days a week to see a slimmer waistline. Yoga is a body-weighted exercise that can be done anytime and anywhere. Many yoga poses focus on your obliques. The side plank, often found in many yoga flow routines, focuses on lifting the hips to work your obliques. Complete a side plank by starting in a plank position, then transfer your weight to your right arm and stack your hips to the right so that you are keeping your weight on your right leg and right arm with your hips lifted high. Julie Gudmestad of the "Yoga Journal" explains that triangle pose, half moon and many twisting poses also target the obliques. Pilates also works to reduce love handles. The American Council on Exercise explains that Pilates moves develop the core muscles by using abdominal control. Pilates exercises like the saw and the criss-cross target your obliques. Complete the saw by starting in a seated position and extend your legs out slightly wider than your hips. Reach your arms out to your sides and inhale to rotate your body to the left, touching your right arm to your left toe. Alternate sides and complete eight reps on each side. Criss-cross by lying on your back with your legs up to the sky. Keep your legs straight as you lower the right leg down to the floor. Return it back to center and then drop the left leg, alternating for 30 seconds. Bicycle crunches work to tone the waist. Lie on your back with your hands behind your head. Draw your knees into your chest and inhale as you lift your head and shoulders off your mat. Extend your right leg above the floor and bring your right elbow to your left knee. Switch, touching your left elbow to your right knee. Alternate twists, completing 25 twists on each side.